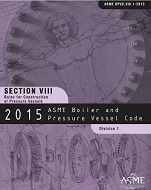 BPVC-VIII-1-2015, Division 1 of Section VIII provides requirements applicable to the design, fabrication, inspection, testing, and certification of pressure vessels operating at either internal or external pressures exceeding 15 psig. Such pressure vessels may be fired or unfired. Specific requirements apply to several classes of material used in pressure vessel construction, and also to fabrication methods such as welding, forging and brazing. It contains mandatory and nonmandatory appendices detailing supplementary design criteria, nondestructive examination and inspection acceptance standards. Rules pertaining to the use of the U, UM and UV Code symbol stamps are also included.